I’m always on the look out for new restaurants along Victoria Park, Albany Highway because it’s so near my house. So even before Vburgerbar was opened, I already noticed the signboards advertising their website and was intrigued. 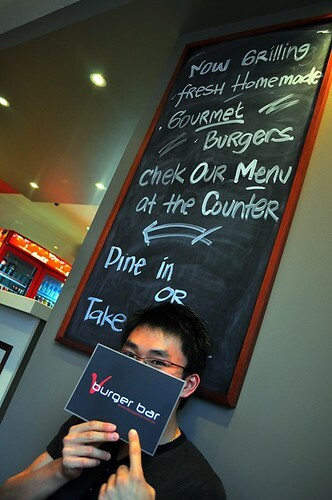 When Jason asked me to suggest a place for dinner, I thought relatively affordable + near + something new = Vburger bar. With the success of the now famous Jus Burgers, it isn’t surprising that gourmet burger bars have been popping up all around Perth. Having frequented Jus Burgers around three times, I have to admit that they do have pretty nice burgers even for a non-burger fan like me. 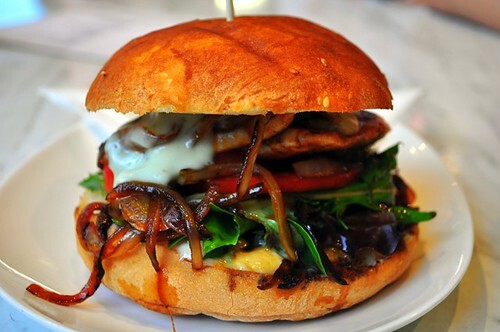 I have yet to try the others like Burger Bistro, F.A.B but I’m sure I’ll get there someday :). First complaint about V Burger Bar, the windows were wide open which might be nice on a breezy spring day, but not when it was so freaking hot in Perth summer. 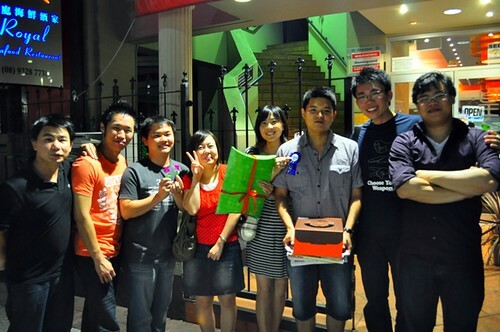 It kinda defeated the purpose of having an aircon in the little bar as well. We were sweating throughout our burger meal. Richard’s burger was the Chickcorian, chicken coriander patty,gourmet salad and lime sweet chilli mayo (I can’t remember the price of the burgers, around $10 – $15 mark). I thought the coriander taste didn’t stand out at all in the chicken patty and was unremarkable, but Richard said it was pretty ok as burgers go. 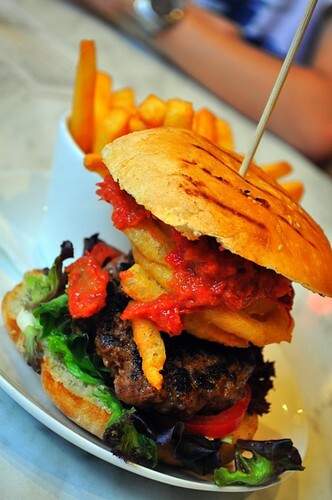 Jo had one of their signature burgers and also the biggest burger on the menu, the F.B.A. 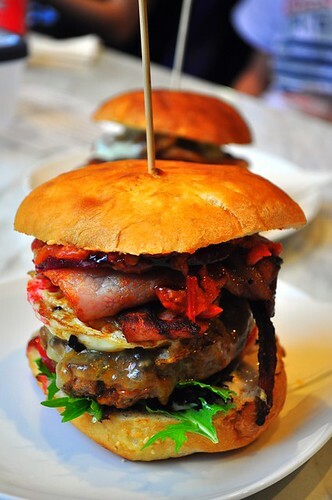 (Full blooded Aussie) which came with prime beef, bacon, fried egg, cheese, sliced beetroot, gourmet salad, BBQ sauce, aioli. 2nd complaint about the burgers, it was quite impossible to eat these towering burgers in one bite, in the end, most of the guys picked it to pieces and ate it layer by layer. Otherwise, I think Jo quite enjoyed her burger. 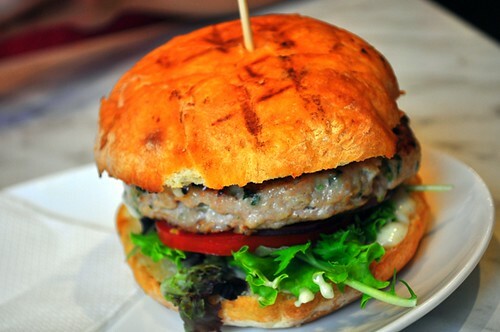 Calv and Jaso both had the Crispy Crisp burger which was prime beef, gourmet lettuce, crispy battered onion, V relish, aioli. Jason seemed to like his burger and one of his comments was I’m too harsh in my comments and he would have given V Burger bar a 7 rating. So not bad for a compliment right? 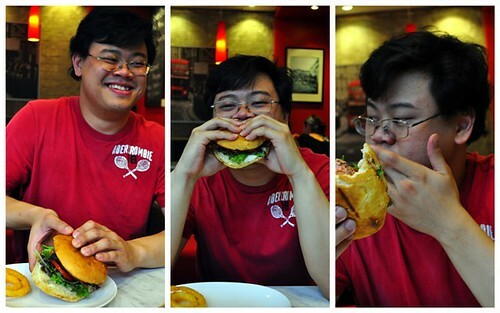 Plus look at happy Calv who demolished his burger in record time! This was HC’s Teriyaki burger which he had to eat with a fork and knife. He said it was quite tasty but a bit too salty for his liking. Overall, I don’t think Jus Burger would be too worried with V burger bar. It’s a good addition to the Albany Highway restaurant strip, and everyone especially liked their soft and very edible buns, but it didn’t manage to convince a burger sceptic like me. When my very first manager (I’m now on my fourth in 2 years) left the organisation, he refused to let me arrange a farewell morning tea for him. He said that he had no one that he wanted to say farewell to and he didn’t feel like celebrating ‘5 years of not achieving anything’. I remember telling A that I never wanted to get into that situation of hopelessness, of losing faith and belief in the system. But lately I’ve been falling into that rut. It’s getting more difficult to get out of bed and go to work. Only my sense of professionalism forces me out of bed to face my desk in the morning. I concoct and fantasize about mystery illnesses to call in sick. Coffees have become my daily highlights and I take long walks to every destination that keeps me out of the office. A told me ‘ if you’re in that situation, the key is to not stay there and whine about it, just get out’. So I am following his advice but it’s taking some time to get there. Meanwhile I’m twitching my feet and tapping my fingers restlessly, my heart is screaming ‘get me out of here!’ and I feel not sad, but angry every day. Angry at the happenings around me, at colleagues that are leaving in droves because they are unappreciated and not valued by a bunch of corporate bigwigs. Today something happened to my fav lunch buddy T that kept me spewing all day. I couldn’t even comfort her because I was so angry myself that I had to walk out of the door. I just need to get out. Dinner started with our favourite Italian in town, Ciao Italia. We ordered the usual suspects, the risotto marinara, chilli mussels, but I tried a new dish at Ciao this time, the penne alla vodka which wasn’t as good as Il Ciao’s but still very tasty. It was a case of over ordering again so we had to ‘dapao’ quite a few things home at the end of dinner, but everyone still had space for a bit of tiramisu. 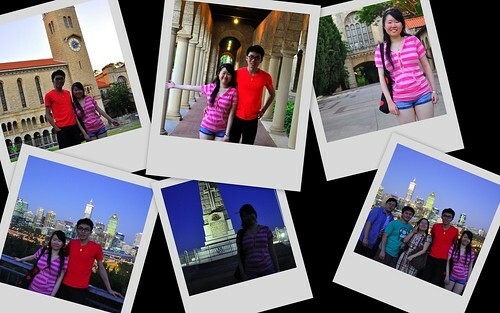 It was still light out when dinner was over so we headed over to Kings Park and UWA for a bit of photo taking. I always like it when people say that my alma mater is very pretty because it’s possibly one of my favourite places in Perth, besides Matilda Bay of course. Day 2 Richard had to work so Jo and I brought Maggie out for a spot of shopping at Harbourtown. 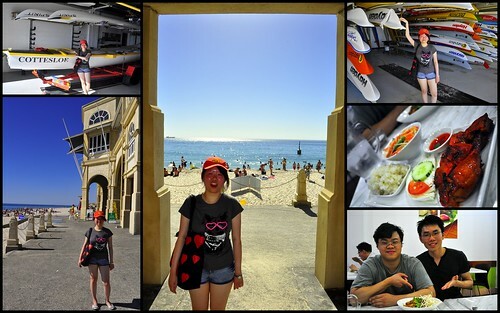 Perth was going through a heatwave then, it was so hot that all of us were kinda listless and tired. Luckily Japanese food at Hanami perked us up a bit and the guys all enjoyed their bento boxes. Brought Maggie to Burswood for some gambling but mostly we just took photos and basked in the atmosphere of whistling bells and chiming token machines. 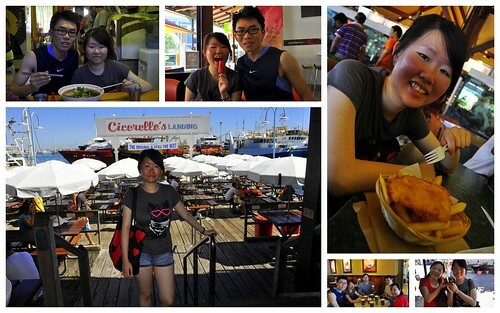 The heat wave reached a peak on Sunday but the heat didn’t stop us from visiting the Fremantle sea port. This was the day where we over ate because we kept trying to hide in coffee shops, ice cream shops, any place with air conditioning . There wasn’t a cloud in the sky but it was so hot that even fish and chips were unappealing No one had much of an appetite but I did enjoy my usual soft cone twist. We couldn’t go back without stopping by the famous Cottlesloe beach. But everyone in Perth had the same idea to go to the beach on that day and it was hard to find parking. I don’t understand why people flock to the beach on summer days, it’s still hot! I pretty much gave up by then and cowered under my umbrella while the brave sister and brother took photos around the Indiana Tea House. No one had much of an appetite for dinner but S & T Thai Gourmet saved the day with their yummy curries, sweet and sour salads and sticky rice. Most importantly, they had strong air conditioning. Monday it was back to work for Richard and I, Calv dropped Maggie in the city and I met up with her for lunch. 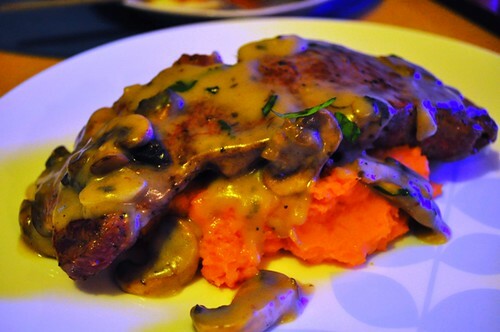 Then it was dinner at home where Richard cooked scotch fillet steaks with sweet potato mash. My contribution was a new recipe of tofu topped with ricotta cheese, basil, bonito flakes, sesame seeds and drizzled with a sweet sauce. Interesting combination which I would try again. It was a very hot four days but I enjoyed showing Maggie around, she’s a cute girl with lots of funny lame jokes with mannerisms that are surprisingly similar to her brother’s. Hopefully it won’t be so hot the next time she visits Perth! I haven’t taken the bus to work for quite a while, being lucky enough to get lifts to the office. But today Jo didn’t go to work (she’s sick, poor thing) so it was the bus for me. Just a few months of car bliss and I was already unfamiliar with the movements of the bus, forgetting to lean and balance on all sides while the bus steered sharply at corners. After a short while I got used to it and was admiring the city landmarks and scenery ( I don’t do that in the car because I’m too busy chatting). I started thinking ‘oh I quite like taking the bus to work’ when a taxi zoomed out from a hidden corner and the bus driver had to brake sharply. So sudden that one of the ladies flew out of her seat right into the lady opposite. It was a good thing that I had a pretty tight grip on the bus pole because I also travelled a few meters in front but managed not to fall flat on my face. Ok, so maybe I prefer the car after all (-____-). I hate summer. I really really do. It’s a horrible 42 degrees day today and I’ve been wilting from the heat all day. When will autumn arrive?! 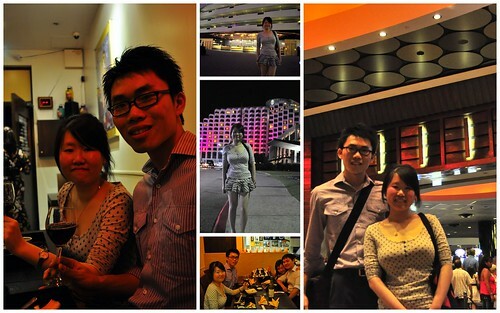 On a cooler day last week, we had a belated birthday dinner for Jason’s birthday at Royal Seafood Chinese Restaurant. We like going to Royal for their dimsum and I’ve heard good things about their dinner fare so it was a good occasion to try it out. 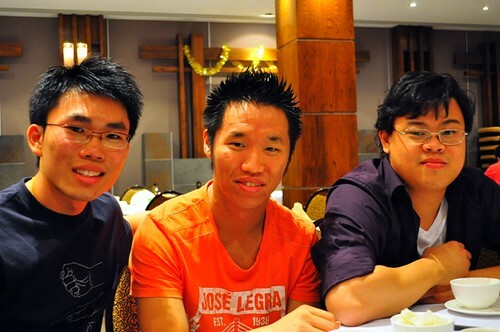 Most of the boys were there including Richard, Ming Sian and Calvin. The food was really quite good. The chilli and pepper squid was deep fried perfectly and the squid was still bouncy and tender with a light batter coating. Sizzling Japanese tofu is always a favourite and this one was thicky sliced and yummy. I can’t quite remember the Gui Fei chicken but I think it was alright but not the best chicken I’ve had. The deep fried honey prawns were quite nice, but I think prawns are wasted if they’re deep fried. Perhaps the most special dish of the nice was the pork trotter which I expected to be braised in soy and the like but it came in a bowl of peppery soup and reminded me of the pork intestine soup that my mum used to make, very flavourful. 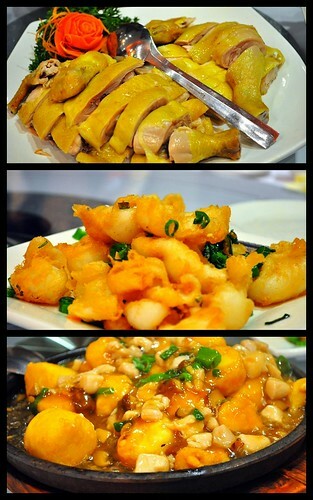 I love everything yam but while I liked the yam in the yam duck, I couldn’t really taste the duck at all. The vegetables in crab meat sauce was a nice change from the normal oyster sauce ao I enjoyed this. I was told that the mei chai kou rou (pork belly with preserved mustard greens) was a must order but for some reason, our pork belly didn’t come out in the usual tender glutinous texture but was kinda dry and hard like barbequed pork, perhaps that was what was special about ? I’m not sure. Everything was beautifully presented similar to their dimsum fare. 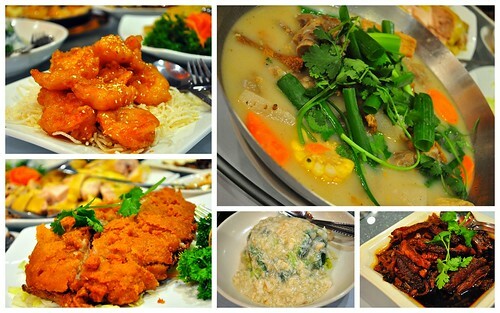 Royal will probably fall into my category of better and more refined Chinese food in town. 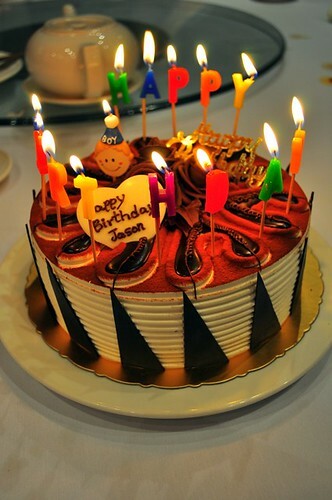 Birthday cake time. We bought a chocolate blueberry cake from Utopia which looked really pretty and had layers of pudding, blueberry and chocolate. 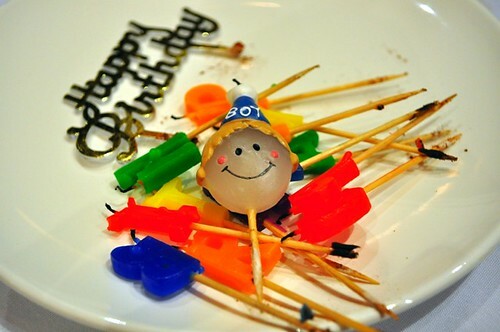 I really liked the candles that Wendy bought, so cute and colourful. 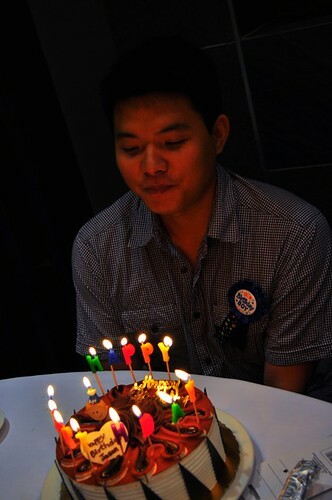 It even had a cute birthday boy candle, I guess because Jason bought a birthday girl candle for Wendy’s birthday. 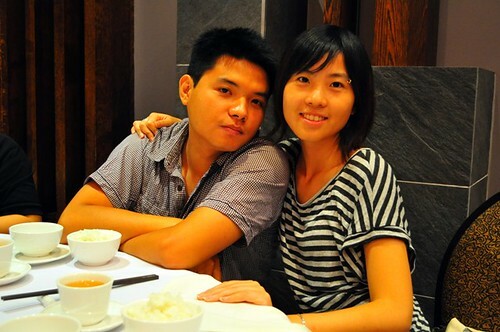 They’re a really sweet couple. 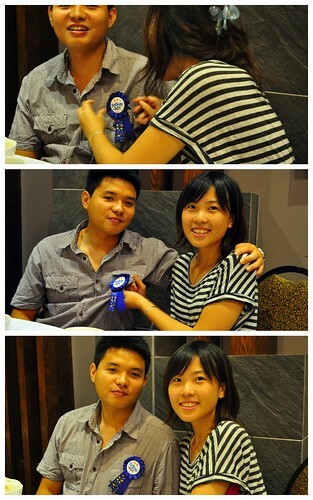 Wendy even bought a birthday badge for Jason but only remembered to pin it on when the singing was over. Ah well, better late than never right? Hehe. Gerry and Mingsian in front of the restaurant. Royal has really nice and elegant surroundings. The birthday boy. 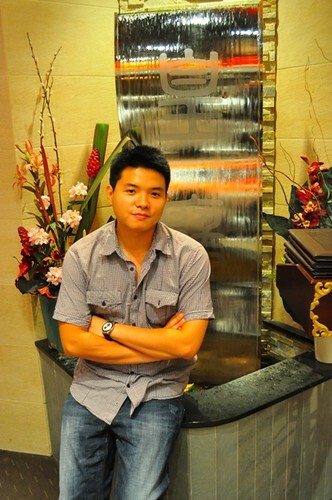 Jason always impresses me with his maturity and patience and devotion to Wendy. It’s been a real pleasure getting to know him and Wendy throughout the year, happy birthday Din Yaw, let’s hope it’s a smooth sailing and fantastic year ahead for you. 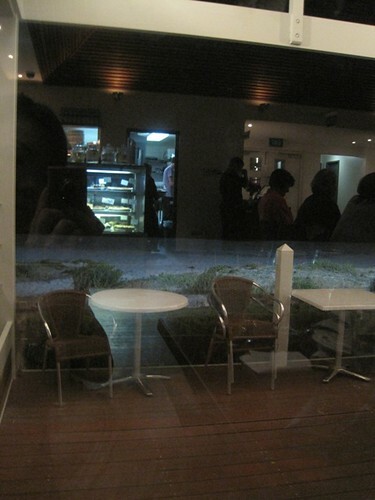 The trip to Busselton/Margaret River was so long ago (back in September 2009!) that it now remains a distant, fuzzy memory. But ask me about the highlight of the trip and I would say‘The Goose Café’ which remains a clear beacon of our long weekend Down South. 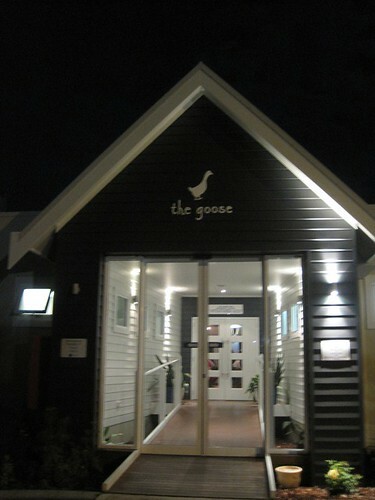 The Goose Café is conveniently located opposite the famous Busselton Jetty. But the gorgeous views and great location was lost on us because we couldn’t see much of it that night. The café itself wasn’t even near Bistro Felix in terms of fine dining surroundings, but the service was pretty good, the atmosphere was warm and friendly and most importantly, the food was delicious. Before the trip, A said to me firmly ‘ If venison is on the menu, order it’. 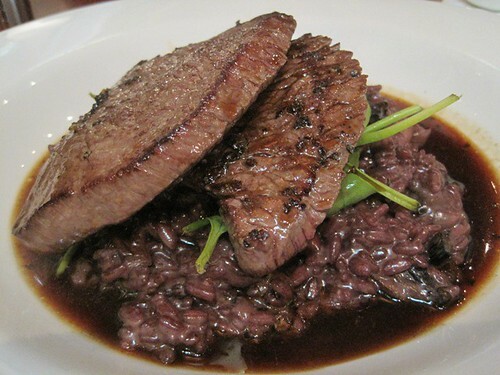 So I knew I had to order the Margaret River venison which came on a bed of risotto. I don’t remember much about the venison but I know it was tender and well cooked, not seasoned enough but the sauce made up for it. The risotto itself was nice but it wasn’t wow. 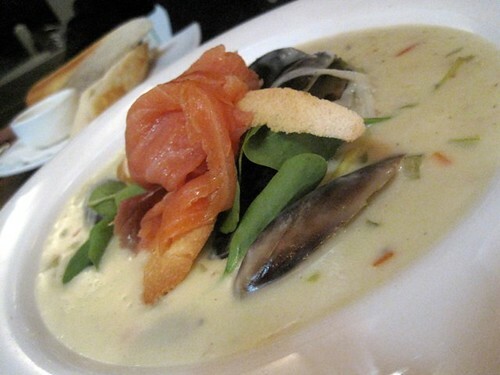 But my ‘award winning’ (not sure what award) seafood chowder which came with a chockful of seafood including snapper, tiger prawns, scallops, mussels and a cured salmon crostini ($37.50) was wow. It was beautiful and exactly what I expected a really good seafood chowder to taste like. The chowder was creamy but yet not overly thick and of the right consistency, The seafood was fresh, the broth so tasty and flavorful that we lapped up every drop and mopped it up with the crostini. So good we were smiling from ear to ear. Richard loved the scallops so much that now whenever we eat scallops he’ll say ‘can’t compare to the scallops at The Goose’. Our dessert was the chocolate fondant with vanilla icecream. 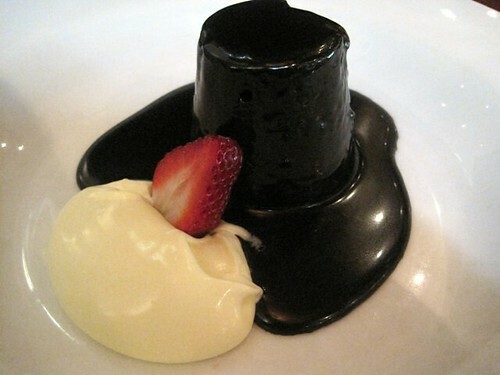 It was sinfully rich, chocolatey and sweet, sweet, sweet. Perfect end to the night. Why was the night so memorable? Could have been because it was the first night of our long weekend and we were floating on air. Maybe it was the bottle of sweet white wine that we shared. Could be the magical atmosphere that permeated the entire night which started from dressing up in our finest and getting lost but happily finding our way through the trusty GPS. But personally I think it was the food and being with a fellow foodie, someone who is as enthusiastic as you are about fresh seafood, experimenting seasonal product, discussing cooking techniques and dissecting magical sauces. 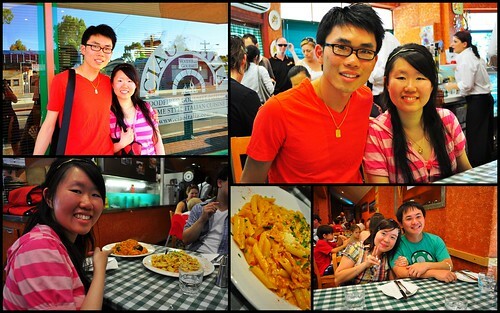 Eating good food was fantastic, but sharing good food with a fellow foodie was even better. Bistro Felix, or Atlantic as it was known back then, was one of the first fine dining restaurants that I dined at in Perth. I remember sharing a lovely and generous seafood platter for two and feeling like a duck out of water amongst the men in suits and fine dressed ladies. Fast forward many years, Bistro Felix has changed ownership, the interior has been repainted and is dark wood elegant. I’m feeling a lot more comfortable in fine dining surroundings but still worry that I may break a wine glass or two. The surroundings are dim, refined and quiet, the tables candlelit and romantic, quiet couples are dotted around and yes, they still dress up here. We were served complimentary bread rolls with butter at the start, there’s something about butter at fine dining establishments, they always taste exceptionally good and Bistro Felix’s butter and bread wasn’t an exception. I already knew what Richard was going to order. 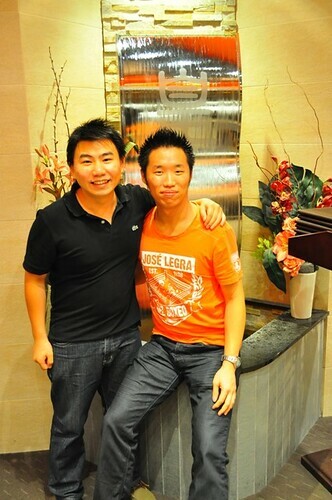 The young man is passionate about his steaks and we’re now on the hunt to find the best steaks in town. While we haven’t sampled the obvious steak experts such as Char Char Bull, Tony Roma’s, Victoria Station etc., they’re definitely on our very long list of must-eat Perth restaurants. It’s funny how so many Perth restaurants get steak wrong, I don’t really cook steaks myself, but I’m guessing the key is the timing and the right temperature, many times we’ve chewed our way through tough overdone steaks or slimy underdone steaks, I can’t decide which one’s worse. 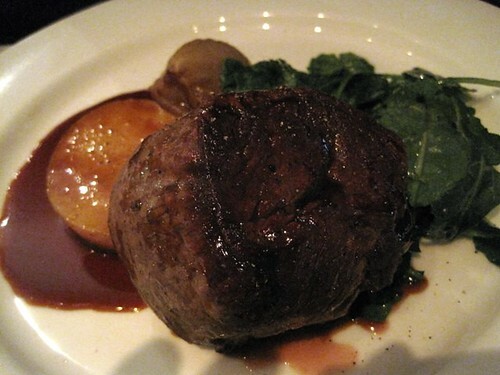 But Bistro Felix’s Harvey beef eye fillet ($42), fondant potatos, confit onions, cavalo nero, with sherry glaze was really very good. Richard’s eyes lit up and we both knew ‘finally… a good steak’. 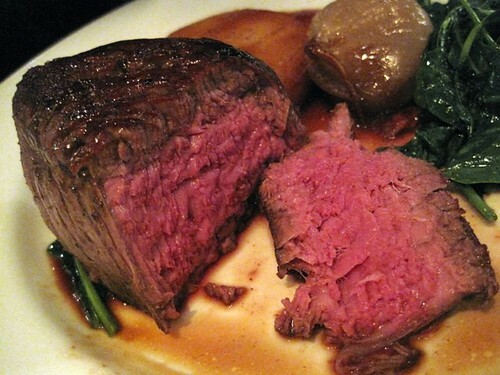 Despite being very thick, the chef managed to cook the fillet perfectly (we asked for medium rare), the meat was blushing pink tender and succulent and the sherry glaze was the perfect accompaniment and absolutely delish.We savored every bite of this. 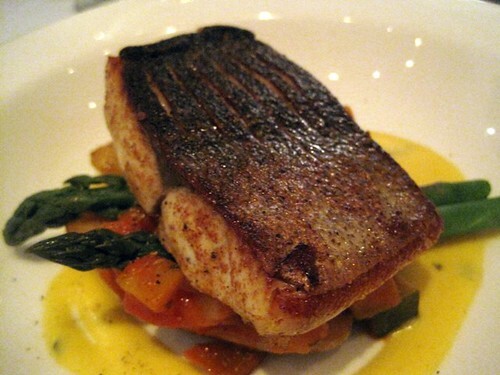 My choice was a healthier version of the fish of the day which was the kingfish, ratatouille, asparagus, béarnaise sauce and kipfler potato ($40). My fish was really lovely as well, everything was light, tasty and went well together. We were both pretty stuffed but decided we couldn’t leave without trying a dessert. Whenever there’s Crème brulee on the menu, it’s a must order for us custard lovers. 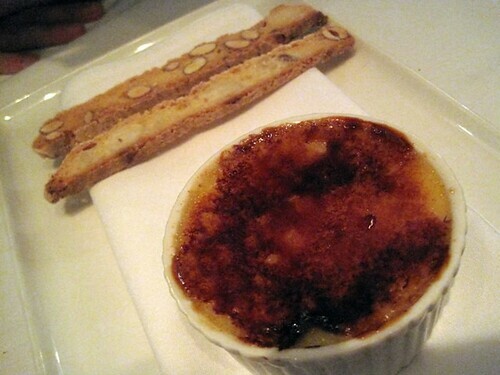 Our crème brulee came with almond biscotti which we used as spoons to scoop up the delectable wobbly and smooth custard. There was something special about this custard, I can’t remember, hints of peach or some kind of fruit. At one point I left to go to the ladies and I knew I hadn’t been missed while I was gone because Richard was still attacking the crème brulee with a glint of satisfaction in his eyes that he didn’t notice my return. It was actually quite funny to watch. I should mention that the service was good, our waitress wasn’t overly friendly, but she was polite and attentive. Our entertainment card gave us ‘buy one main get one main free’ but they didn’t scratch off my card allowing us to return again, and return we shall, after we’ve made our way through the other Perth restaurants. Surely, Bistro Felix is amongst one of the best in town.